Heavy eyed, work done. Pages of the novel stack up. The washing up, ignored. Gold plates cake crumbed. Coffee cups everywhere. Clothes are washed, their colours part of the changing design scape we have here. Darkish colours today. A rack of socks in variant textures. 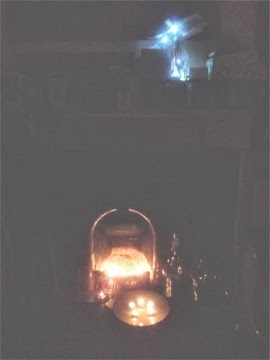 The fireplace houses burnt out tea lights. One day we'll take out the pillow that blocks the chimney draft. 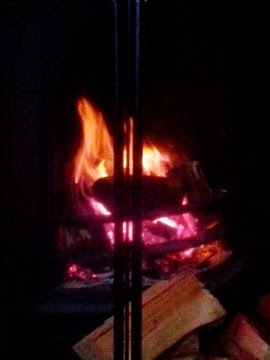 Toast marshmallows on modest flames. We'll use the barbeque forks or improvise with twigs. Listen to vinyl, to old record hiss. Admire the shadows of the avocado leaves, the poke of ginger shoot, the spiking aloe, the umbrella geranium. We're not sure if the pineapple will survive, but it's always worth a try. Arms on the wooden artist's model are open wide, embracing. It has a shadow that does the same.